Normal service has resumed with a crafty post! Our Messy Church group are making up shoeboxes for Operation Christmas Child tomorrow. Guess who had a rush around the local shops this morning to buy bits and bobs? I thought it best that the children selected things to make up boxes for children their ages, so they picked toys and toothbrushes and so on that they thought would be suitable. I think they enjoyed it, though at 2 years old Jess didn’t understand and was a bit disappointed they weren’t for her. The only thing we couldn’t find in our village shops were hats, and I’d rather rip my toenails off with pliers than take my two into town on a Saturday. I decided I’d make them instead! I already had a pattern which I’d bought from Craftsy last year. Now, me and this pattern, we have ‘history’. As in I couldn’t get my gauge to match the pattern so I moved up hook sizes until my double knit yarn hats were so holey they could have been colanders. They were quite honestly rubbish! Anyway, a year on and with a lot more experience with patterns, I decided a better idea would be to meet in the middle. 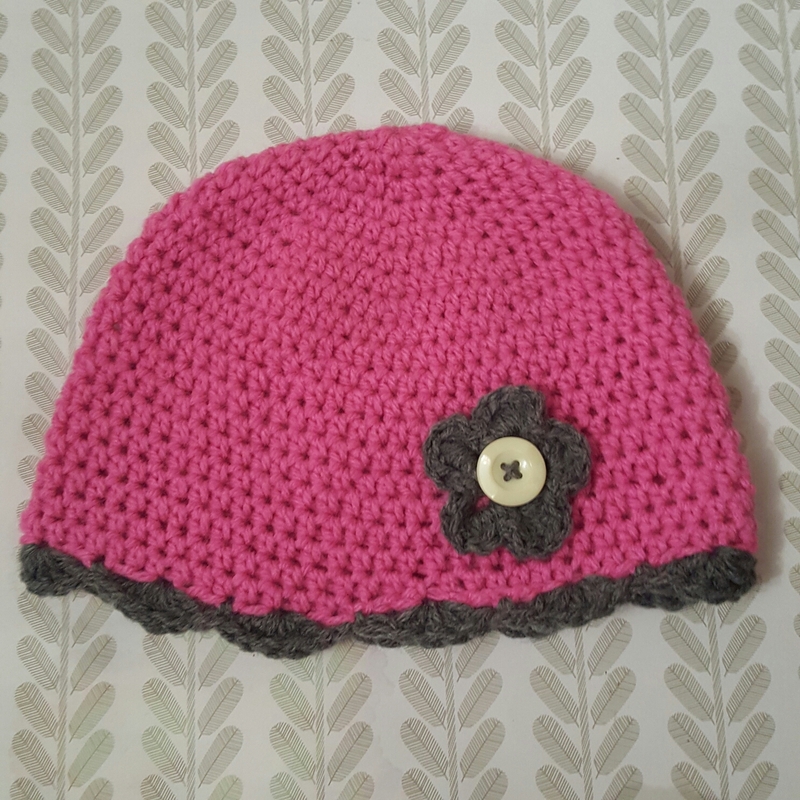 I went up one hook size and then made a larger size of the hat, so the age 2-3 was just made using the pattern for 4-8. Simple! The actual pattern has ear flaps but I just wanted to make basic beanies, given that I had less than a day to make them! I added a shell border to the girly one, as well as a little flower. The boys one was harder so I just added a contrasting stripe. 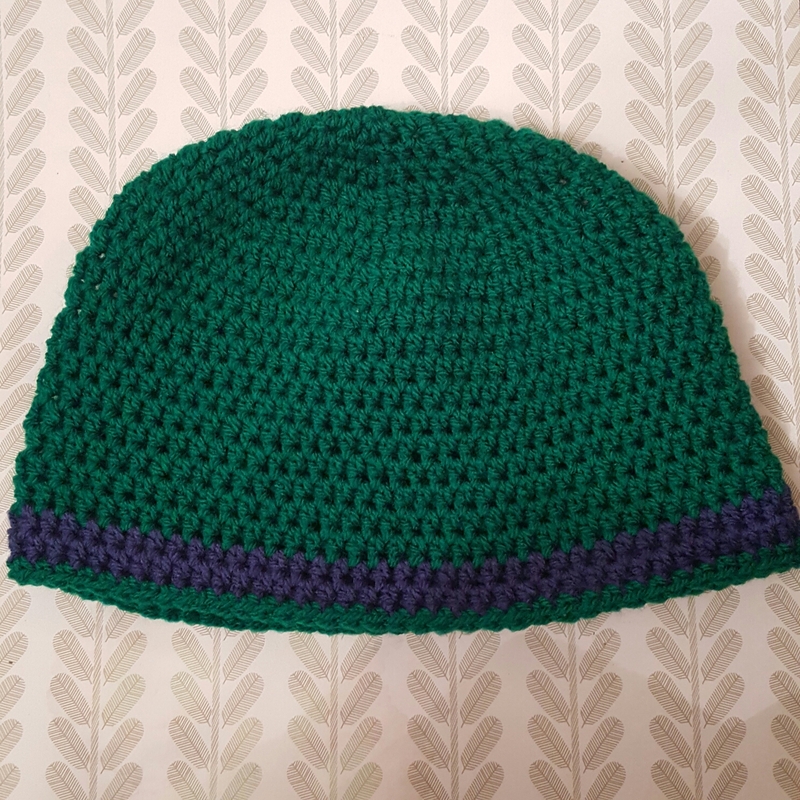 I wanted to use a crab stitch border but because the hat is worked in a spiral and crab stitch is worked backwards I would have ended up with a wonky join so I just went for a double crochet border. I have a feeling the hats might be a tiny bit large length wise, especially the boys one, but I guess it’s better than being too small. Also I don’t know who the recipients will be so I’m just going to hope they go down well! They were very quick to make up, which is good because Jess is most upset that the pink hat is not for her. It looks like I might have to whip up another one! I hope they keep two little heads somewhere very warm. The purposes of the shoeboxes have been a talking point in our house and I think William at least understands why we are doing it. For now I’m going to have a rest as my arms are hurting from the extreme crochet session. It’s got me thinking about how else I can use my crafty hobby for good reasons. I know a local neonatal until want knitted or crocheted square so I think that might be my next little extra project. Both hats are very cute. Lol, pressure can be positive! What a lovely idea and the hats are darling. the hats are just adorable! you a quick one! I get what you are saying about not wanting to go to town! Thank you, I was a woman on a mission! Awww, how beautiful are these!! Hard work, but very, very worth it. Well done Mrs. C. GREAT MAKES! I can’t imagine for one moment that they won’t. They’re so beautiful, and so beautifully made too! Highly desirable hats! Amazing that they could be worked so quickly – I didn’t realise that about crochet. Those shoebox gifts are such a great idea. I haven’t done any for years but, not that you have reminded me, I will seek out an organiser. I love the idea of adding a little something homemade. I’m sure those hats will put a smile on some little face. Thank you, I hope you find one. It did the children good to see where they were going too.